 On Wednesday, February 12, 2014, the second ice storm in as many weeks hit IPPL’s gibbon sanctuary. Our trusty Ranger is no more. 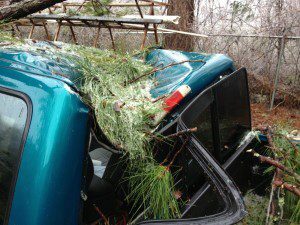 John McGreal had just gotten out of the truck to move a fallen branch; this was only one of many near-misses. 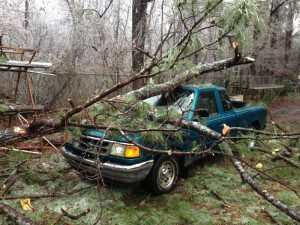 That first storm, it turned out, had weakened numerous tree limbs, especially among our pines. The second onslaught sent huge branches—some weighing hundreds of pounds—crashing down from heights of over 50 feet. 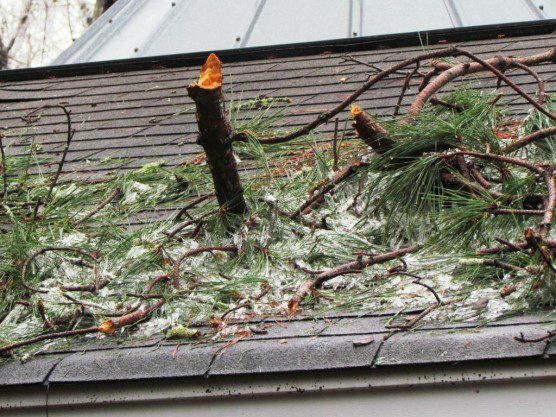 Palu-Palu and Jade’s roof was pummeled by jagged pine boughs spearing down into it from 50-plus feet overhead. 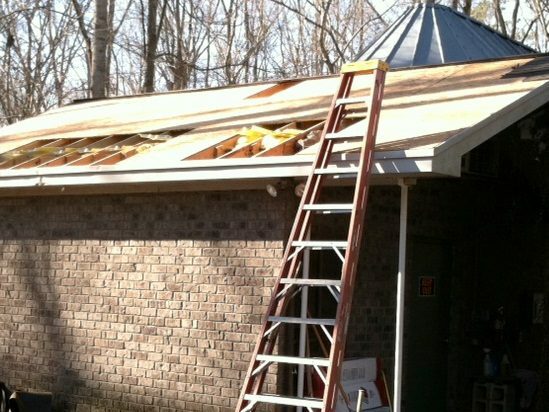 This roof and others will need to be repaired or replaced. 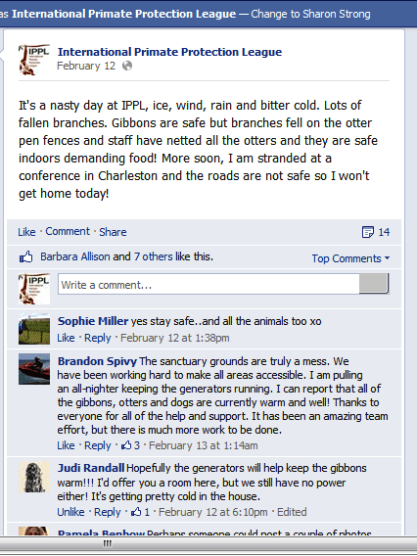 Our animal caregiver Samantha Martin was the first to suspect that we might be in for a tough time. 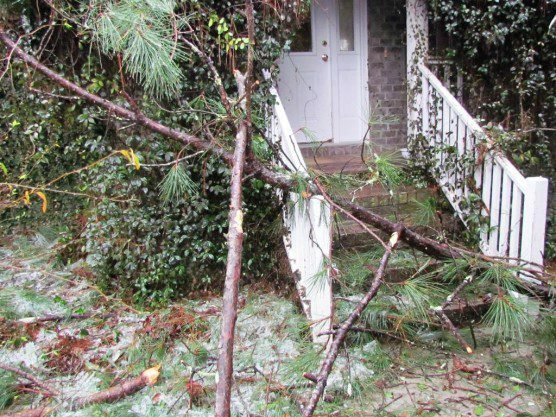 At about 8:00 Wednesday morning, she was headed toward Gibbon House #9 when, two seconds after hearing a loud Snap!, a 10-foot branch fell to the ground about five feet behind her. She radioed her fellow staff members to inform them of her near-demise; they thought she was just being dramatic. At first. 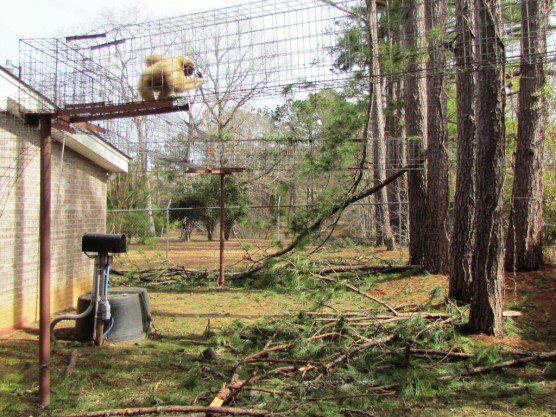 Then branches started raining down, hard, on our Animal Care Cottage, the main building where we do gibbon food prep/storage and emergency vet care. 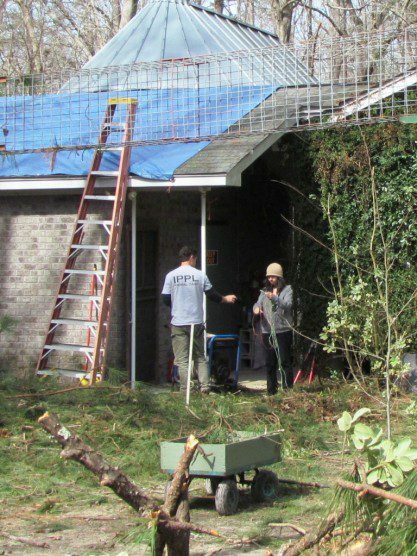 The area between the Animal Care Cottage and the office became a real hazard zone, due to bombardment by falling pine branches. 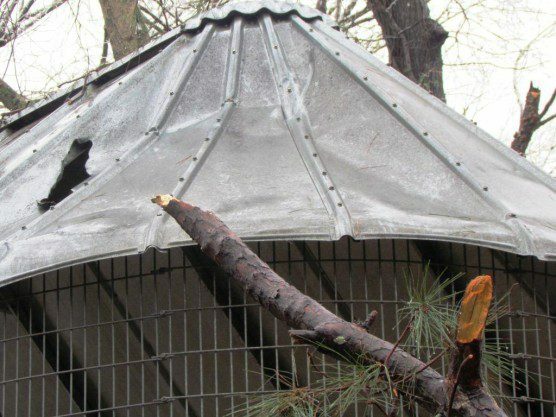 Gibbon aerial runways and structures like this enclosure roof were also damaged by falling tree limbs. Many of these limbs, sheared off to a jagged point, turned into javelins that punctured the roofs of structures (especially near Jade and Palu-Palu), smashed through the cab of our trusty Ranger pickup truck, and nearly landed on top of our animal caregivers any number of times. Fencing along the perimeter and within the sanctuary was flattened, too. Then, at about 10:00 a.m. (about the time the freezing rain started up…), the power went out. The storm left the sanctuary without electricity for some 33 hours in frigid temperatures. We had about half a dozen gas and diesel generators lined up to provide emergency power overnight—but with a generator, you can’t just “set it and forget it,” you have to make sure it hasn’t run out of fuel, tripped a breaker, or run into some other difficulty. Our animal caregivers took it in turns to monitor the equipment day and night to make sure all the Gibbon Houses were comfortable and secure. Our caregiver Brandon had the unenviable graveyard shift Thursday morning. All day Thursday, as cleanup efforts began, everybody kept an eye out for returning power. When the electricity came on again around 7:00 p.m., Hardy and Rachel spent another couple of hours making sure everything was going back online safely. The silver lining in all this? 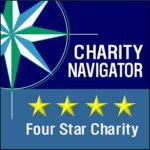 Our friends in need! Robin (right) took time away from the destroyed fencing around her horse pastures to lend our caregiver Hardy Brown a hand at the sanctuary. A number of other volunteers have helped with cleanup, too. On Valentine’s Day, we sent out an urgent e-mail appeal for funds to help us repair and rebuild. In addition, our good friends at the American Anti-Vivisection Society sent out a special e-mail appeal yesterday to their supporters asking for contributions. We need to: replace our essential Ranger pickup truck (which we use for any serious hauling around the sanctuary), repair damage to buildings and other structures, clean up the sanctuary grounds (we’ll need to hire an arborist to get rid of some of the remaining snagged limbs), and replace one of our generators. To date, we have raised over $10,000. We have been so touched by the response! 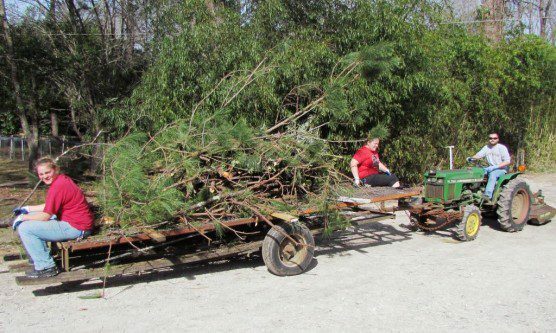 We have also had a number of volunteers take time away from clearing away their own debris to help us get things under control. Today we have had wind and rain that will bring down even more snags. 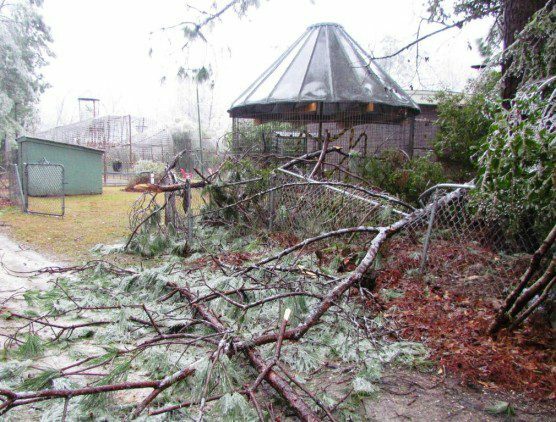 A local man was actually killed two days ago in his backyard when a snagged tree limb fell on top of him. Members of our animal care team (left to right, Rachel, Samantha, and Brandon) were hard at work earlier this week hauling away debris so that the roofers could get at the damaged buildings. We are so grateful that none of our animals, staff members, or volunteers have been hurt throughout this ordeal. It’s going to take us weeks to get back to “normal.” But we’re on our way! Cathy surveys some of the damage near her house. Thank you to everyone who has volunteered or donated to help us recover from this disaster!